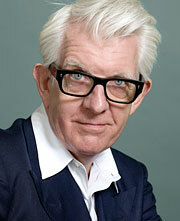 Join us as we welcome Nick Lowe to the Clive Davis Theater. Hear Lowe on stage, along with GRAMMY Foundation Vice President Scott Goldman, discussing his illustrious career as a songwriter, performer and producer, and previewing songs from his first new album in four years. Lowe spent the 1970s "busy not fitting into three successive movements," according to the New York Times. As the bassist and primary songwriter for Brinsley Schwarz, Lowe was one of the primary catalysts of pub rock. As the co-founder and house producer at Stiff Records, he would help create the blueprint for the modern indie rock label. He ushered in British punk and new wave, helming historic recordings for The Damned, Elvis Costello, The Pretenders and others, not to mention his own groundbreaking releases of the time. More recently, Lowe has enjoyed a bona fide "second coming" (Village Voice) with a string of critically acclaimed albums, including 2007's At My Age — his fastest-selling and best-reviewed release in decades — and the forthcoming The Old Magic set for September 13 release on Yep Roc.